Needle exchange centres should be set up all over England to help protect the growing numbers of young people injecting steroids and other performance drugs, say NHS advisers. Heroin addicts are no longer the only people in danger of contracting HIV and hepatitis C from reusing needles and syringes, says the National Institute for Health and Care Excellence. Clinics are seeing increasing numbers of body-conscious young men, as well as young people of both sexes who are injecting new psychoactive substances for a bigger and cheaper hit. About 60,000 people, at a conservative estimate, injected anabolic steroids last year, says Nice. Needle exchange programmes were set up in the 1980s and 90s when the Aids epidemic took off to cope with what was at the time the new and lethal threat of HIV infection. Now they are facing a new challenge with the emergence of a different kind of drug injector. Nice recommends that the NHS should provide services at gyms and outside working hours and develop policies to help people aged under 18 – and even under 16 – who are injecting. 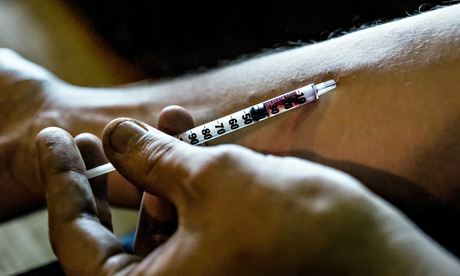 Separately, a study published by the Lancet medical journal has found that offering heroin addicts £30 in shopping vouchers incentivises them to have the three successive vaccinations to protect themselves against hepatitis B, a cause of cirrhosis and liver cancer. Only 9% of those offered advice to have the vaccination completed the course on time, compared with over 45% of those who received vouchers as a reward. Harm reduction clinics offering clean needles and syringes have for some time been seeing a new category of clientele alongside heroin users. David Rourke, from CRI’s Arundel Street Project, a harm reduction programme in Sheffield, said they had started with a fortnightly clinic for steroid users, which became weekly and sees at least seven new clients a week. He said young people were also injecting new psychoactive substances – “any of the legal highs”. These include mephedrone, known as MCAT or Meow Meow; methoxetamine, called mexxy or MXE; and ketamine, or ket. “We’re hearing of people trying to inject pretty much any of them,” he said. Price was one reason – they could get a bigger hit with a smaller quantity compared with other drugs. Competitive bodybuilders were not the only people injecting steroids, Rourke said. There were also “people who want to look good to go out on a Friday night, those who work on construction sites and even people who work in emergency services.” They all wanted to feel at peak physical capacity, he said. The study on shopping voucher incentives for hepatitis B vaccinations was carried out in 12 NHS centres countrywide by experts from King’s College, Imperial College and University College in London. Professor John Strang, from King’s National Addiction Centre, who led the study, called it a “definitive trial”, which should lead to financial incentives for drug users being adopted in the NHS. About 15-25% of people with chronic hepatits B die of liver disease. Vaccination would save lives and save the NHS money that would be spent in treatment. A further trial of offering cocaine addicts vouchers to quit is under way. Financial incentives for breastfeeding and attending for cervical cancer smears have also been considered.